From their relatively humble beginnings producing simple but infectious top 20 Pop-Dance tunes to their more recent sophisticated top 5 Pop-Dance tunes, classic albums, film & TV scores and beyond, Orbital have crafted some of the most innovative yet accessible electronic music since their inception in 1989 whilst at the same time retaining great respect for their live work due to their extraordinary shows around the globe which pay as much attention to the live mixing of visuals and choice of imagery, as to the live sound itself. Perhaps, though, one of their greatest achievements is their longevity which is firmly based on a sound that is recognizably their own, coupled with a will to proceed at their own pace and on their own terms with little regard to the industry machinations that surround them or the musical fads and trends that come and go. Originally from Sevenoaks (a suburban 'commuter reservation' somewhere in deepest Kent) the Hartnolls grew up listening to second generation punk (Crass, Dead Kennedys, Crucifix...), mutant-electro (Severed Heads, Hula, Adrian Sherwood...) and early Hip Hop (Phil went over to New York in the mid-eighties in order to 'find' Hip Hop). By 1988 Paul had contributed two electro pieces (!) to FFrr's 'House Sound Of London Volume 4' under the name D.S.Building Contractors, but it wasn't until the following year that the first true Orbital release emerged: the single 'Chime'. The original 1,000 copies released through Jazzy M's Oh-Zone label sold out immediately through word of mouth alone and the track was picked up by London Records subsidiary FFrr with whom it soon became a nationwide Dance anthem. This translated into a number 17 singles chart position and gained the Hartnolls a 'Top Of The Pops' appearance where they 'performed' (ie. reluctantly) whilst sporting anti Poll Tax T-shirts. A decade later, the often sampled and bootlegged 'Chime' is still regarded as a classic and has remained one of the highlights of many a live set over the years. In the period 1990-1991 the burgeoning UK dance scene was still very much perceived as a short-lived phenomena with limited crossover potential and the very idea of a 'dance' artist producing an album as opposed to an endless stream of 12' cuts for club consumption was still a relatively uncommon occurrence, yet when Orbital released their untitled debut long player, or 'green' album, it was to unanimous critical approval and was early proof that dance/electronic music could after all produce albums that would have to be taken as seriously as those produced by conventional Rock acts. Over the coming months remixes carried out by Orbital became further evidence that the Hartnoll brothers had by now established a distinctive sound of their own whilst retaining a characteristically diverse approach to their work. In the summer of '93 they became instrumental in setting-up and then went on to headline the Midi Circus Tour, a roaming electronic extravaganza which traveled the UK spreading the latest word on live dance music. Next came the release of their second album. Once again an untitled double LP, it became a resident in the upper reaches of the UK Indie album charts for the next few months. The 'brown' album, as it's now generally referred to, bore the now classic Orbital live standards 'Halcyon+on+on', 'Remind' and 'Impact (The Earth Is Burning)', going on to feature highly in most end-of-year Best Album polls. 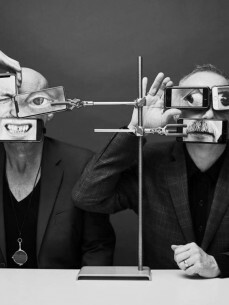 A tour of the US (their second) and two sell-out nights at the Brixton Academy (New Years Eve and New Years Day) finally brought Orbital's hectic year to a close. March 1994 saw the release of their John Peel session (recorded the previous Autumn) which featured two tracks re-worked from the 'brown' album together with two new compositions. At Glastonbury, Orbital played the coveted final slot on the second stage, previewing some of the new material from their soon to be released third album. The show was a resounding success and sections were broadcast by Channel 4 and John Peel. On its release, 'Snivilisation' entered the album charts at number four, quickly followed by the single 'Are We Here?'. The album broke the hitherto 'no title' rule and sported for the first time a non-graphic cover courtesy of noted painter John Greenwood. Musically, too, it was a departure from their previous collections, the material being far more disparate in style than before. On the accompanying 'Are We Here?' UK tour Orbital played to packed houses throughout the UK where they played 'in the round' from the top of a specially constructed scaffolding tower before heading off to play the Woodstock 2 festival in the US. 1995 saw the release of their remix of Madonna's 'Bedtime Stories', followed by a triumphant headline slot at Tribal Gathering and Main Stage performance at Glastonbury, which many thought even better than that of the previous summer. The year's new material came in the shape of a track recorded for the Sony Play Station game 'WipEout', an untitled EP featuring 'Times Fly' (which proved to be too long to be eligible for chart inclusion) and a track, 'Adnan', donated to the 'Help' compilation. In April 1996 Orbital released a new single, the dulcimer-driven 'The Box' (number 11), quickly followed by their fourth long player, 'In Sides'. Perhaps their most adventurous collection up until that point, the album may have been a more studied and sombre affair than 'Snivilisation' yet the Hartnolls' love of film soundtracks revealed some startling results, and though it's well-crafted mixture of beats and cinematics unwittingly opened the floodgates to a stream of largely uninspiring copycat James-Bond-with-a-dance-beat efforts, 'In Sides' was universally acclaimed and entered the album charts at number five on week of release. By May, the Hartnolls embarked on their first full UK tour for over two years which included a triumphant performance at a filled-to-bursting Royal Albert Hall, proving once and for all that Orbital had finally escaped the limiting definitions of 'Techno', 'Dance' et al, whilst at the same time taking live electronic music even further into previously uncharted territory. By the end of the year 'In Sides' featured highly in most of the 1996 Best Albums polls. On New Years Eve Orbital played to 12,000 people at Alexandra Palace and released a live version of 'Satan'. The track had originally been recorded in 1991, though it had only reached as far as 31 in the charts when it was released that year as a single. This time around it entered at a much more convincing number three. In April 1997 Orbital went on to release their own version of the theme tune to the 60's cult TV classic 'The Saint' from the soundtrack of the Hollywood remake starring Val Kilmer as Simon Templar. The film itself (understandably) received mixed reviews though the single became their second UK top three success since Christmas, whilst on the live front that year Orbital's main appearances were at Tribal Gathering, two sets at the Phoenix Festival and the closing slot on East coast leg of Lollapalooza in the States. To mark the first ten years of Hartnoll activity, in April they released their fifth album, 'The Middle of Nowhere', which became their third consecutive Top 5 chart placing, preceded by their most successful UK tour to date. 2000 -- After taking a short and well-earned break the Hartnolls began recording their 6th album, The Altogether. The first track to make its airing was Meltdown when it was supplied for a modern dance project as part of the South Bank Centre's Meltdown Festival which was curated by one of the Hartnolls' all time heroes, Scott Walker. Orbital completed a small world tour in South Africa, Greece, Ireland and Japan. Orbital play a one-off live show at the Hammersmith Palais as part of Q magazine's pre-award ceremony celebrations: one of three new tracks previewed on the night ("Tension") is later broadcast on Channel 4. On New Years Eve they round off the year with a live set at the London Arena in Docklands with Leftfield. The set is broadcast the following day on Radio One.